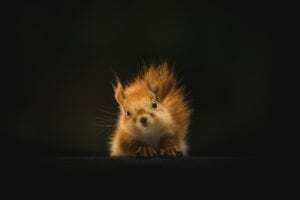 How Do You Know if There Are Squirrels Inside Your Home? Squirrels are cute little rodents which typically live in trees and scurry around outside, collecting nuts and staying out of the way of humans. However, as squirrels look for a nice place to stay for the winter or build a nest, they often venture into homes and residences. It can be difficult to find out if there are squirrels in your home, but there are a few signs that indicate a squirrel’s presence. Firstly, squirrels are mostly quiet when inside homes, but are commonly found when homeowners hear scurrying or scratching sounds coming from the walls or attic, squirrels are a distinct possibility. As they move through the walls, they may get struck and have to scratch themselves free, which makes a loud noise and can give away their presence. The second most common way to discover a squirrel problem is by finding damaged entry points to a home. Like any other rodent, squirrels have powerful teeth and will chew through strong material if they are dedicated enough. Outer panels and siding are popular ways for squirrels to sneak in, although shingles are the easiest way for squirrels to enter a home. A determined squirrel can gnaw through shingles to gain access to the attic, their most popular spot in a home. Next, squirrels cannot stay inside a home forever without a consistent food supply. As they venture back and forth from a home, they can leave footprints in snowy areas. Squirrels have four fingers on their front paws, which are slightly smaller than their hind paws, which have five fingers. Tracks can appear on the roof, porch or garage, depending on where the squirrels venture, as squirrel tracks may indicate their presence on the property. Lastly, squirrels can cause odors and damage when living in a home long enough, which will eventually become visible or discoverable. If they do not have a consistent food supply or get stuck when maneuvering around the inside of a home, squirrels can die in the inside structure of a house, leaving an awful stench as they decompose. Squirrels will also build up waste products the longer they spend in a home, which can cause structural damage and bring harmful bacteria into the house if left untreated. If any of these symptoms of a squirrel infestation match up with your experiences, call the experts at Shumaker Animal Control to deal with the problem for you. Our experienced team will take care of the problem in a timely manner, ensuring that your home will not be damaged any further by squirrels. Call us at 443-854-8072 or view the our website online for more information. This entry was posted on Wednesday, December 26th, 2018	at 3:36 pm	. You can follow any responses to this entry through the RSS 2.0	feed. Both comments and pings are currently closed.